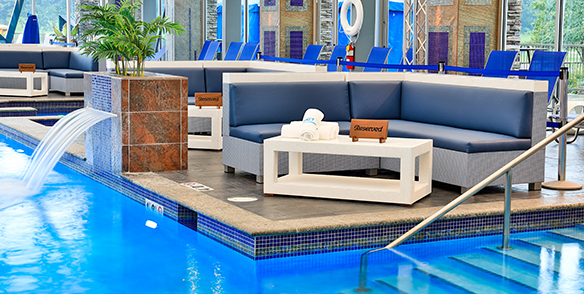 Come relax and indulge your senses at Get Wet Ultra Pool, our indoor/ outdoor pool & bar at Mount Airy Casino Resort. Get Wet Ultra Pool is a generously heated four-season pool experience featuring an underwater passageway allowing guests to swim continuously from indoors to outdoors to our two adjoining pools. Grab a drink at our chic poolside bar and restaurant area while you bask in the sun or swim a few laps. The pool bar also offers an assortment of light dining options during the day. Private luxury cabanas replete with day beds and televisions are available day and night for those looking for a more lavish lounge to share with friends and family. If that wasn’t enough, don’t forget to stroll out to our massive outdoor terrace featuring table-sided fire pits and expansive views of the resort’s lake and golf course. Comfortable poolside daybeds. Come and Get Wet! Daybeds hold up to 6 people. *Call Guest Services at 1.877.682.4791 to reserve daybeds pricing.